Parque Nacional Ciénaga de Zapata is in Matanzas province of Cuba. The national park is one of best birdwatching areas in the world, plus it has scuba diving and beautiful beaches. It's on Cuba's south coast, in the middle of the country, about a two-hour drive from Havana. The Bay of Pigs is where the Cubans defeated an American invasion in 1961. The communist propaganda billboards along the road from Australia to Playa Larga may be the best in Cuba. Support for the government is strong on the Peninsula de Zapata because it was the poorest region in Cuba before the revolution, and the first area that the communists developed, with roads, schools, and a hospital. It is also one of Fidel's favorite areas because of the 1961 victory. The Parque Nacional Ciénaga de Zapata is similar to the Everglades National Park in Florida. Viazul  has bus service from Havana to Playa Larga and Playa Girón, and then on to Cienfuegos and Trinidad. You'll need a car to get around the national park. Maybe a four-wheel drive. The Criadero Cocodrilo, or crocodile farm, is halfway between Australia and Playa Larga. Everyone likes it, especially the under-twelve-year-olds. You get to see lots of crocodiles, and hold a baby crocodile, and eat crocodile meat in the restaurant. The other tourist attraction at the crocodile ranch is a boat ride to Guamá. This is an island in a lake, the Laguna del Tesero (Treasure Lake). Fidel Castro enjoyed vacationing on the island and commissioned the building of a Taíno native village and 32 sculptures depicting native life. A sign at the ticket office says, in English, that the Taíno village is "the most exciting place on Earth&#151;don't miss it!" Guamá was pleasant and relaxing, but "exciting" it wasn't. The boat ride was also fairly expensive. If you're short on cash and/or time you might want to skip Guamá. The beach at Caletón, near Playa Larga, on the Bahia de Cochinos (Bay of Pigs). Playa Maquina, just east of Playa Larga, is a beautiful beach. The sand is white coral. The water is warm, clear, shallow, and calm. Palm trees and limestone cenotes line the shore. You'll probably have the beach to yourself. The guidebook calls this beach "Caleta del Rosario." 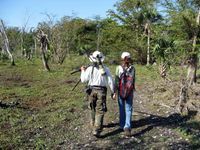 "El Chino," a birdwatching guide in Ciénaga de Zapata, Cuba, and his wife. The Ciénaga de Zapata is one of the best birdwatching areas in the world. A good birdwatching guide in the national park is Orestes Martinez Garcias, a.k.a. "El Chino." He's a solid, experienced birder. Every time he turns around he points out a new bird. We saw the Tocororo (Cuban Trogon), which is the national bird. We saw the Bee Hummingbird , which is the world's smallest bird and is found only in Cuba, and is fairly common in parts of the Ciénaga de Zapata. We also saw the Cuban Pygmy Owl, Cuban Tody, Great Lizard Cuckoo, Black-Cowled Oriole, Osprey, Cuban Blackbird, Greater Antillean Grackle, Cuban Bullfinch, Striped-Headed Tanager, American Redstart, Yellow-Headed Warbler, Palm Warbler, Red-Legged Thrush, Cuban Crow, Black-Whiskered Vireo, Cuban Vireo, Loggerhead Kingbird, La Sagra's Flycatcher, Cuban Peewee, Fernandina's Flicker, West Indian Woodpecker, Cuban Green Woodpecker, Cuban Parrot, Smooth-Billed Ani, Zenaida Dove, Common Ground Dove, Grey-fronted Quail Dove, Laughing Gull, Common Moorhen, Northern Jacana, American Kestrel, Turkey Vulture, Blue-Winged Teal, Wood Stork, Cattle Egret, Green Heron, Little Blue Heron, Neotropic Cormorant, Cuban Emerald, Great Blue Heron, Brown Pelican, Bare-legged Owl, and the Black-and-white Warbler. Other endemics that occur in the Zapata region include Blue-headed Quail-Dover and Cuban Parakeet. El Chino's e-mail is: [email protected]; telephone: 045-98-7354 or 045 98 7355; mobile 52 94185; address: Caletón (just west of Playa Larga), Cienaga de Zapata, Matanzas, CP 43000. The best guidebook is "Field Guide to the Birds of Cuba," by Orlando H. Garrido, Arturo Kirkconnell, and Roman F. Company. Playa Larga a dive shop with decent guides and equipment runs shore dives into the Bahia and also cenotes (freshwater caves). Cost is 25-40CUC per dive [2016-Jan], and can be arranged from any casa in town. They leave at 9am and return around 3pm. If you only do 1 dive, you wait on the beach for the group and return together. Dinners at the casa particular "Susurros de Mar" in Caletón include a choice of chicken, fish, lobster, crocodile (cocodrilo), or jutía&#151;giant tree rat! Everybody likes crocodile meat. Jutía is, shall we say, the choice of the adventurous traveler. "El Chino" makes a sarsaparilla drink that beats any root beer (not alcoholic). 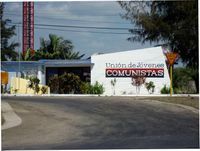 Unión de Jóvenes Comunistas (Young Communist League) building in Playa Larga, Cuba. The ULC is like the Boy Scouts or Girl Scouts. Their newspaper is called Juventud Rebelde (Rebel Youth). In Playa Larga, the town at the top of the Bahia de Cochinos (Bay of Pigs), there are numerous casa particulares from 15-25CUC. One of the cheaper ones is just on the north edge of town, a restaurant/casa combo run by the sweetest couple Edel and Raquel. Another centrally located one is within sight of the town bakery, run by the lovely Ramon y Amarise (25CUC). 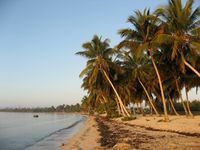 In Caletón, the village just west of Playa Larga, the casa particular "Susurros del Mar" ("whispers of the sea") is on the beach, a few feet from the water. The rooms are nice, the food excellent, and the large living room is sort of the local pub for the neighbors. 25 CUC per night, 10 CUC for supper, and 4 CUC for breakfast. Contact: Nivaldo Ortega, Caletón, Cicuaga de Zapata, Matanzas; telephone 015 225 2021. Hotel Playa Girón The Playa Giron Diving Center offers services from the shore but does not provide boat transportation since the diving sites are less than 80 meters from the shore. Trinidad Viazul buses stop on their way through Playa Larga, on the west side of the main road (across from the bus shelter). Be there by 9:30am but bus usually arrives 10:15am. Goes to Cienfuegos (7CUC) or Trinidad (12CUC) [2016-Jan]. This page was last edited on 29 August 2018, at 04:33.